Weekday Rambler: Who Says Diet Food Can't Taste Good? Who Says Diet Food Can't Taste Good? Another confession. I have gained too much weight! The high life has to stop. I joined Weight Watchers at the worst possible time of the year. Thanksgiving and Christmas are the biggest eating seasons on the calendar. In an effort to stay "on program" as they say in "WWese", I have been searching for recipes that use ingredients that we love and are diet friendly, too. I think I found a winner. I have prepared this dish three different ways, but finally hit on the version that we like best. 1. 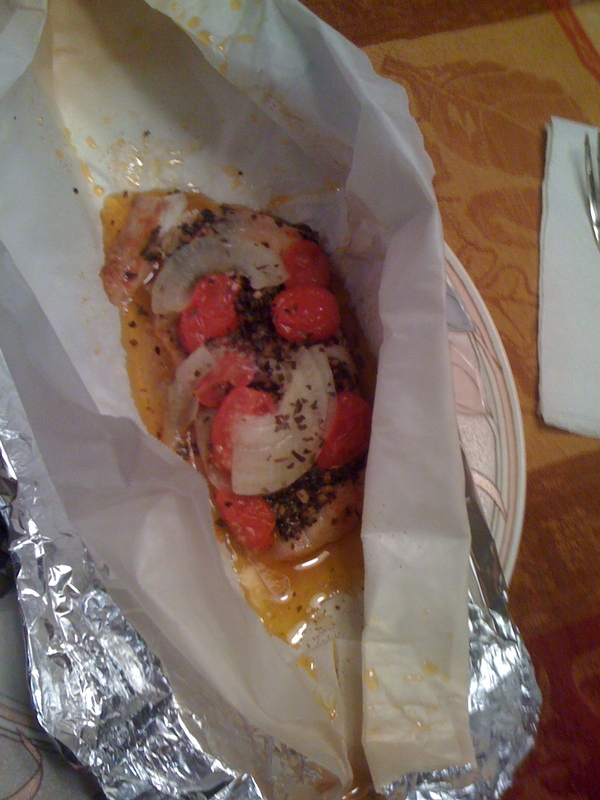 For each fillet, layer on your counter top, a piece of foil, shiny side up, and a piece of parchment paper on top of the foil. Place one fish piece on each "packet"
3. Whisk together the parsley flakes, etc. with the olive oil. 4. Sprinkle each fillet generously with paprika. 5. 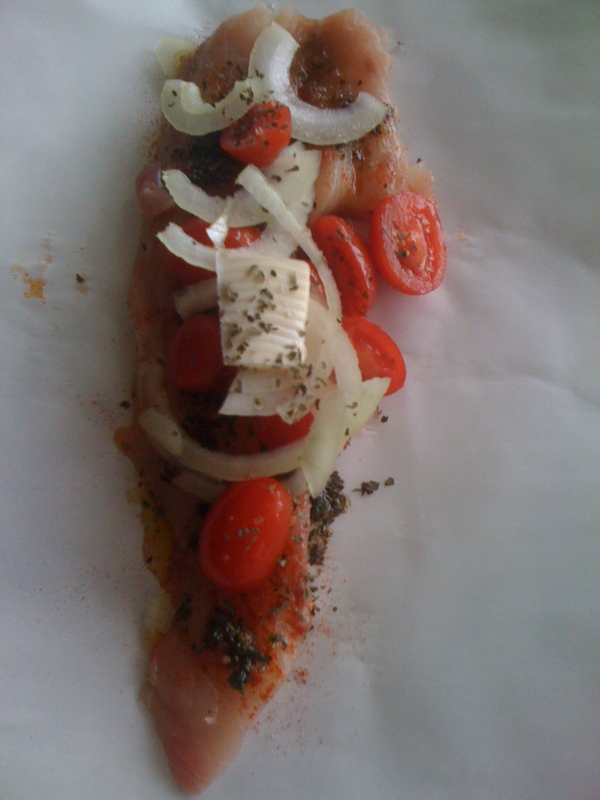 Brush each fillet with the olive oil mixture. 6. Place tomato slices and onions on top of the fillets and top with a tiny pat of butter and lemon juice. 7. 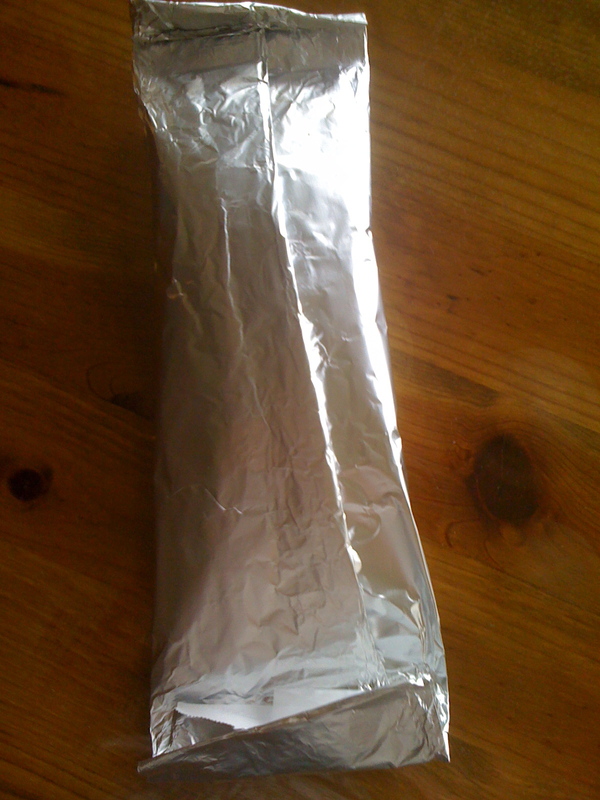 Fold the packets to seal across the top and on the ends. You don't want them to leak while cooking. 8. Bake on a cookie sheet at 425 degrees F for about 20 minutes. Remove from oven and let the packets sit for about 5 minutes. Enjoy this dish and don't feel guilty about overeating. It's a treat that will make you feel that the meal is very special! I have also tried it with artichokes and black olives. Another version featured fresh lump crab meat. 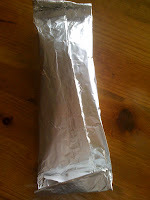 You can prepare the packets early in the day and refrigerate them until baking time. If you do this, you should increase the baking time because they will be cold when they go in the oven. Let me know if you have other ideas on this French classic! Looks good, but I'm not much of a fish eater unless it's fried. Too many points on WW for that! You are a woman with so many talents! Wow! Thanks! I love fried fish, too, but my digestive system doesn't like it. Too old for fried anything. Happy Thanksgiving! Sounds good. I will try it! Years ago when I was on Weight Watchers I learned about this simple, but delicious way of broiling fish. sounds delicious. will try it! I'm 'tackling' the unwanted extra kilos at the moment too, and with Weight Watchers as well. It really is so sensible and teaches portion control well. Your fish recipe looks lovely, it's very French to make paper wrapped parcels to cook in the oven. I quite like doing things at different times to everyone else, like starting being stricter with my eating on a Thursday or a Friday rather than a Monday. Rather like you with starting now. Imagine showing up at Christmas parties or Christmas day looking slender and svelte with your clothes fitting nicely. That's a very enticing goal. Rebecca at http://powerloveandselfcontrol.blogspot.com/ is also being careful with her food at the moment. I love the sayings she has on her sidebar. They really are very inspiring. Fiona, Thanks for the comments and the link to Rebecca's blog. will check it out. The weekends are the worst time for me to have self control over my eating. So far I have lost 6 pounds...almost 3 kilos!